The Best Web Development blogs from thousands of top Web Development blogs in our index using search and social metrics. Data will be refreshed once a week. Also check out Web Development Podcasts and Web Development Youtube Channels list for Top videos on Web Development. 2.13 Scotch | Developers bringing fire to the people. 2.55 In'saneLab | Web development, software development, and more! Web Development newsletter is a comprehensive summary of the day's most important blog posts and news articles from the best Web Development websites on the web, and delivered to your email inbox each morning. To subscribe, simply provide us with your email address. Freiburg, Germany About Blog An online magazine for professional Web designers and developers. Our mission is to support the community with articles about the latest trends and techniques in web development. We try our best to impress you not with the quantity but with the quality of the articles we publish. Facebook fans 291,668. Twitter followers 989,994. Facebook fans 101,881. Twitter followers 128,230. About Blog Codrops is a web design and development blog that publishes articles and tutorials about the latest web trends, techniques and new possibilities. Facebook fans 89,166. Twitter followers 177,599. About Blog Speckyboy Design Magazine offers insightful tutorials, time-saving techniques, fresh and useful resources and inspirational art, covering web design and development, graphic design, advertising, mobile applications and even, the occasional Lego post. Facebook fans 53,355. Twitter followers 73,408. Vancouver, Canada About Blog Webdesigner Depot is one of the most popular blogs about web design trends, tutorials and much more. We include Photoshop Tutorials, WordPress Plugins, and Web Development tools. Facebook fans 276,291. Twitter followers 684,257. About Blog Tips, Tricks, and Techniques on using Cascading Style Sheets. CSS-Tricks* is created, written by, and maintained by Chris Coyier and a team of swell people. Facebook fans 71,827. Twitter followers 340,322. About Blog Thousands of free tutorials and online courses to help you learn software development from mobile devices to web applications and everything in between. Follow our blog to improve your coding skills and workflow. Facebook fans 149,753. Twitter followers 168,880. Facebook fans 1,216,825. Twitter followers 582,698. Everywhere! About Blog Design Shack showcases inspiring web design, alongside resources and tutorials for you to succeed in the same way. We only offer the cream of great design, filtering through lots of the redesigns that occur every day across the Internet, and cataloguing the greatest projects out there - perfect for getting that spark of creativity going again. Facebook fans 51,999. Twitter followers 23,553. INDIA About Blog Web/Mobile design & development blog, providing user interface design freebies, resources, articles, tools and more! Facebook fans 66,912. Twitter followers 32,908. Cary, NC USA About Blog Programming, Web Development, and DevOps news, tutorials and tools for beginners to experts. Hundreds of free publications, over 1M members, totally free. Facebook fans 20,357. Twitter followers 42,978. Milwaukee, Bend, and St. Pete About Blog Chris Coyier, Alex Vazquez, and Tim Sabat, the co-founders of CodePen talk about the ins and outs of running a web software business. CodePen is a playground for the front end side of the web. It's all about inspiration, education, and sharing. Facebook fans 296. Twitter followers 67,157. 13. Scotch | Developers bringing fire to the people. About Blog Scotch is a web development blog discussing all things programming, development, web, and life. Facebook fans 20,257. Twitter followers 48,706. Facebook fans 35,349. Twitter followers 223,503. About Blog Tutorialzine is the one place for high quality web development tutorials. Learn cutting edge techniques in web development and design, download open source components and participate in the community. Facebook fans 23,631. Twitter followers 33,721. San Francisco About Blog The leading source of news & information about APIs, chronicling the evolution of the global API economy & providing the web's most relied-on API Directory. Facebook fans 6,772. Twitter followers 28,538. Facebook fans n/a. Twitter followers 70,451. About Blog CodeCondo is an aspiring community for developers, designers, and business people. Codecondo aims to explore, collect, as well as share useful news, tutorials, tips, resources and tools, on design, development and other inspirational topics. We expect that everyone will find something here that is useful and interesting. Facebook fans 2,022. Twitter followers 3,238. WorldWide / Singapore About Blog A digital community devoted in sharing web design and development freebies, great tutorials, useful Internet resources, online tips and tricks for web designers. Facebook fans 69,652. Twitter followers 57,624. Greece About Blog Pontikis.net is a technology and how-to blog. Web labs is the space where open source projects are presented (demo, docs, tutorials). The purpose of the site is to review web technology, its business and culture and to provide breaking tech news. Facebook fans 3,451. Twitter followers 387. Facebook fans 11,703. Twitter followers n/a. About Blog A curated collection of the best news for designers each day. Facebook fans 693. Twitter followers n/a. Facebook fans 297. Twitter followers 50,058. Facebook fans 8,185. Twitter followers 5,073. Facebook fans 5,766. Twitter followers 17,678. Facebook fans 2,060. Twitter followers 21,828. Facebook fans 933. Twitter followers 5,890. Facebook fans n/a. Twitter followers 12,217. Sydney, Australia About Blog Keep up to date with the latest web design, development and technology news. Wiliam are a leading Australian web site design, development, strategy and online marketing firm. Facebook fans 349. Twitter followers 686. Facebook fans 1,160. Twitter followers 336. Facebook fans n/a. Twitter followers 2,014. Indiana, USA About Blog ColorWhistle is a Web development company that offers web design, branding, digital marketing and much more. Facebook fans 189. Twitter followers 1,322. Facebook fans 2,032. Twitter followers 5,991. Hamburg, Germany About Blog Jens Oliver Meiert on web development and design (and sometimes philosophy, art, and adventure). Writing about quality code and world views since 1999. Facebook fans n/a. Twitter followers 2,282. About Blog Bespoke Web and Software - designed, built, tested, trained, deployed & supported. For every business, any process and all technology - mobiles, tablets & desktops. We focus on business process management ensuring our solutions help businesses of all sizes to reduce costs, increase productivity and stand out. Turku, Finland About Blog Get a powerful, complete notification system for your web app. Facebook fans 12. Twitter followers 32. Washington DC - London About Blog Read about the latest web development and SEO trends on the ArtDriver's official Inbound marketing blog. Facebook fans 117. Twitter followers 272. United States About Blog Maven is a eCommerce development company working as a globally distributed team of developers and designers. We are passionate about eCommerce and do it well. In our blog we cover topics related to web development and eCommerce in general. Find fresh tips, guides, reviews and news. Facebook fans 82. Twitter followers 1,154. About Blog A handcrafted, carefully selected list of web development related resources. Published usually every week. Facebook fans n/a. Twitter followers 1,083. Chandigarh, India About Blog Developing and delivering innovative Web, Mobile and Cloud based solutions to a Global clientele of Startups, SME's and Enterprises for over a decade. Facebook fans 2,504. Twitter followers 2,502. Facebook fans 550. Twitter followers 2,518. Indore India About Blog Chetaru - International Web design agency providing web services in Newcastle, Leeds, Durham and India. Specialists in Website Design, app development, and digital marketing. Facebook fans 2,286. Twitter followers 509. Rotterdam, The Netherlands About Blog Read writing from 4kCode on Medium. The 4 keys to write successful code are vision, team-work, innovation and communication. Every day, 4kCode and thousands of other voices read, write, and share important stories on Medium. Facebook fans 461. Twitter followers 137. Canada About Blog Educational Seo training post that will help you take your marketing efforts much further ahead for your website. Explo-Media is your one stop for affordable and effective Seo & Web Solutions. We are located at 230 Versaille Street, Wendover, ON, Canada near Ottawa. Facebook fans 2,876. Twitter followers 34. About Blog New Dimension Design helps small to medium size businesses define, build and expand. We help you reach your business goals mainly through branding, website design, online marketing, and book design. Facebook fans 80. Twitter followers n/a. San Francisco, California About Blog Igvita is the blog of Google’s web performance engineer, Ilya Grigorik. Articles heavily focus on tips and techniques regarding web performance, security, etc. Although articles aren’t published on a frequent basis, each one is very well detailed and easy to understand. Facebook fans n/a. Twitter followers 53,175. About Blog The definitive source of news about one of the web’s most popular front-end tools. Facebook fans n/a. Twitter followers 1,135. About Blog Pixelhint is a web design Blog dedicated to detailed, easy-to-follow and high quality web ui design tutorials, we also share unique, pixel perfect website templates and web resources for web designers and developers to download, all for free, each freebie is made carefully with attention to details. Facebook fans 1,672. Twitter followers 613. Facebook fans n/a. Twitter followers 10,065. Viet Nam About Blog Latest technology news and tutorial. Designveloper is basically a team of young and enthusiastic web developers, graphic designers, mobile developers, VOIP experts and academic teachers. Facebook fans 1,375. Twitter followers 538. About Blog Huptech Web - developing to drive sales, leading ecommerce website design & development company to increase the traffic & engagement towards your online store. Facebook fans 222. Twitter followers 25. Facebook fans 43. Twitter followers 311. 55. In'saneLab | Web development, software development, and more! About Blog Usability audits, UX and web design, front-end development, WordPress development, and more. All that helps to create a better online presence - for you. Facebook fans 1,597. Twitter followers 56. About Blog We provide professional, custom, affordable web design and development services as well as marketing plans that will improve your web presence. We are a trusted and professional website design company. About Blog Long Island's leading Website Development Agency. Specializing in Web Design, Web Development, Logo Design & Brand Identity, SEO, Social Media Marketing. Facebook fans 427. Twitter followers n/a. About Blog Ind Global have lot of work success and stars so long from the leading clients and it will expected always that our client will recommend our service to their friends and official friends. Indglobal is a best web development by covering a different aspects of designing issues. Facebook fans 57,905. Twitter followers n/a. Bay Area, CA About Blog Coding Horror is the outlet of seasoned web application developer Jeff Atwood. The blog tackles all manner of software development and security topics, but it’s Jeff’s interest in the human component of development that makes the blog stand out. Facebook fans n/a. Twitter followers 233,611. About Blog A List Apart explores the design, development, and meaning of web content, with a special focus on web standards and best practices. Facebook fans 39,867. Twitter followers 148,055. Gda?sk, Poland About Blog Create and collaborate across your entire design workflow with UXPin. Go quickly from wireframe to interactive prototype, then iterate rapidly to a finished product. Facebook fans 144,068. Twitter followers 23,774. Facebook fans n/a. Twitter followers 490. North Andover, Massachusetts, About Blog User Interface Engineering is a research and training company focused on web and application usability. Its Brainsparks blog is an industry-leading resource, covering all aspects of UI and UX development – with founder Jared Spool offering his expert insight on a weekly basis. Facebook fans 2,057. Twitter followers 33,197. India About Blog Acodez is an international award-winning Web design & SEO agency based in India, with satisfied clients across 22 countries. Facebook fans 6,291. Twitter followers 915.
designinstruct.com About Blog Design Instruct is a regularly updated web magazine for designers and digital artists where you can find and learn design tips and tricks. Facebook fans 12,262. Twitter followers 62,542. Facebook fans 219. Twitter followers 693. Facebook fans 67. Twitter followers 16. 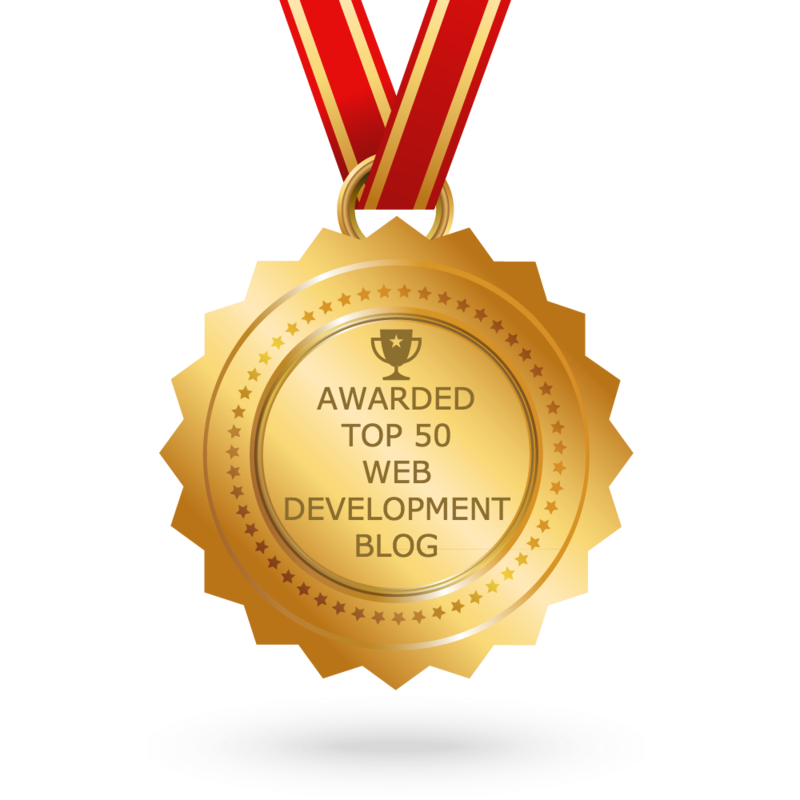 CONGRATULATIONS to every blogger that has made this Top Web Development blogs list! This is the most comprehensive list of best Web Development blogs on the internet and I’m honoured to have you as part of this! I personally give you a high-five and want to thank you for your contribution to this world.